Ideallean Protein — You deserve a protein shake made for YOU! There are literally hundreds of men’s protein shakes on the market, and they’re loaded with sugar, calories, and other ingredients that do nothing for you. 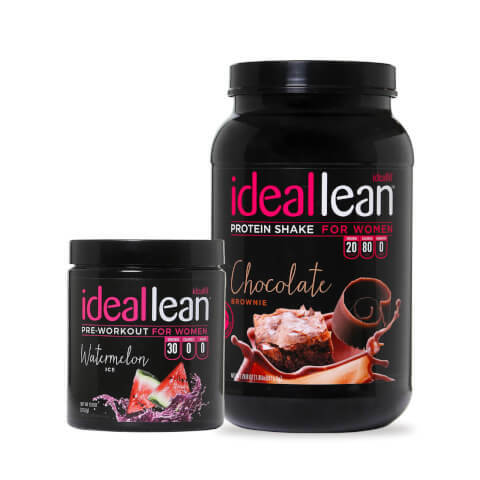 IdealLean Protein has just 90-100 deliciously smooth calories and 20 grams of whey protein isolate, so you can fuel your body right! Ideallean Pre-Workout — No more having to go through your workouts lacking energy, focus, and motivation. IdealLean Pre-Workout was created to take your training results to a whole new level of intensity. Formulated especially for women, IdealLean Pre-Workout features ingredients like Phosphatidylserine and Green Tea Extract standardized to provide 50% EGCG to help you with your fitness goals! I absolutely love Idealfit's protein and preworkout flavors. I've tried many before coming to Idealfit and now I'm hooked. I will not be going anywhere else!